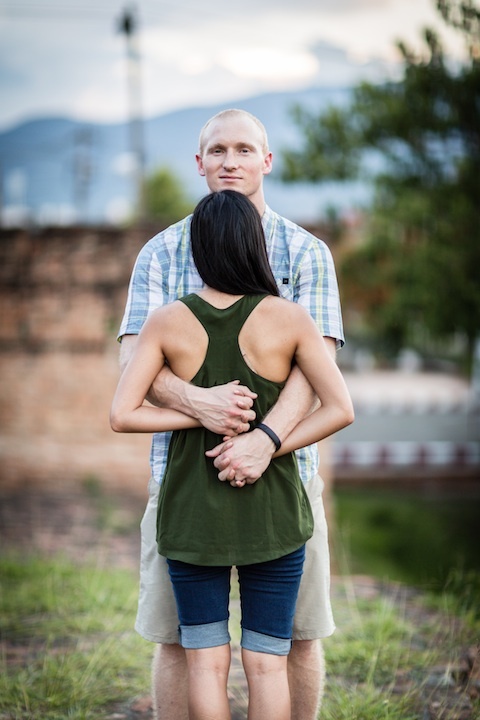 Yes, we had a lot of weddings over 2014, but we promise that’s not all we did on our tour of Southeast Asia! Outside of all the weddings and wedding preparation, we were able to have some amazing adventures in each of the places we went. 1. 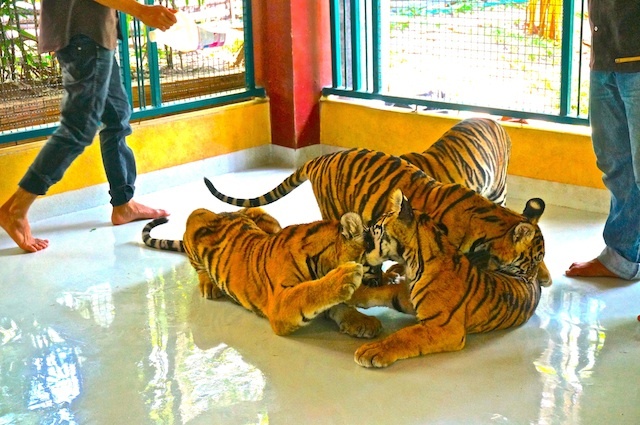 We did the “hands-on” learning experience with the animals in Chiang Mai. 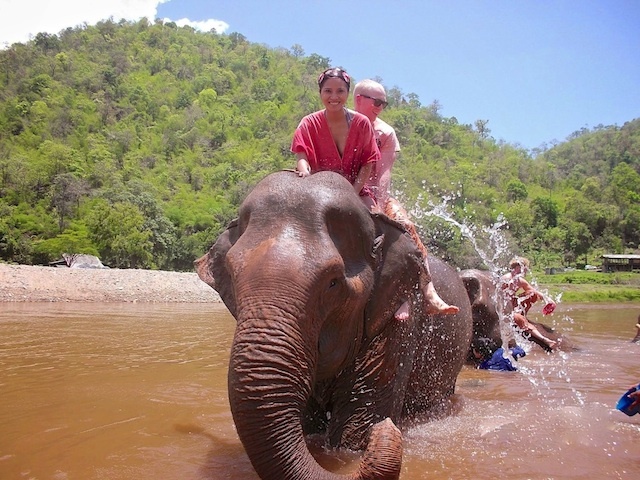 Bathing and feeding these giant, beautiful elephants on a hot Thailand day. 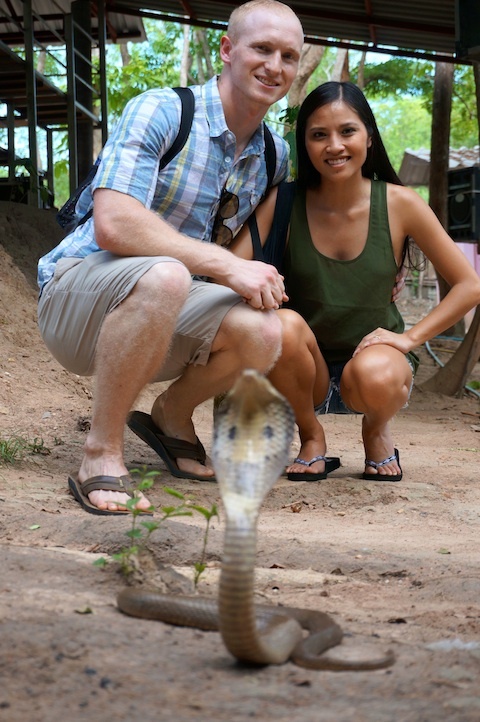 Learning about the king cobra of Thailand. Taking a “cat nap” after some rousing play of pouncing on tree branches. 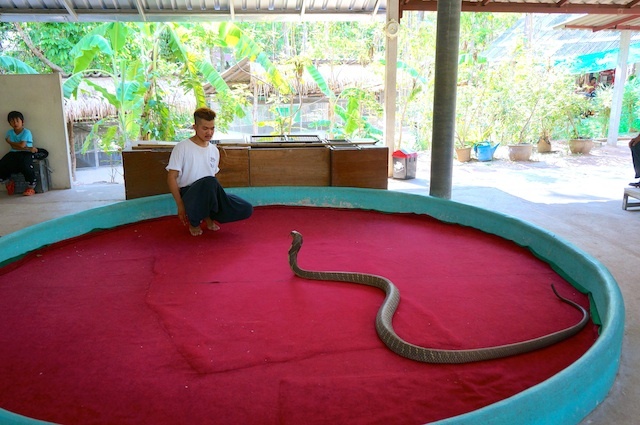 Seeing the agility and power of a full-sized king cobra. 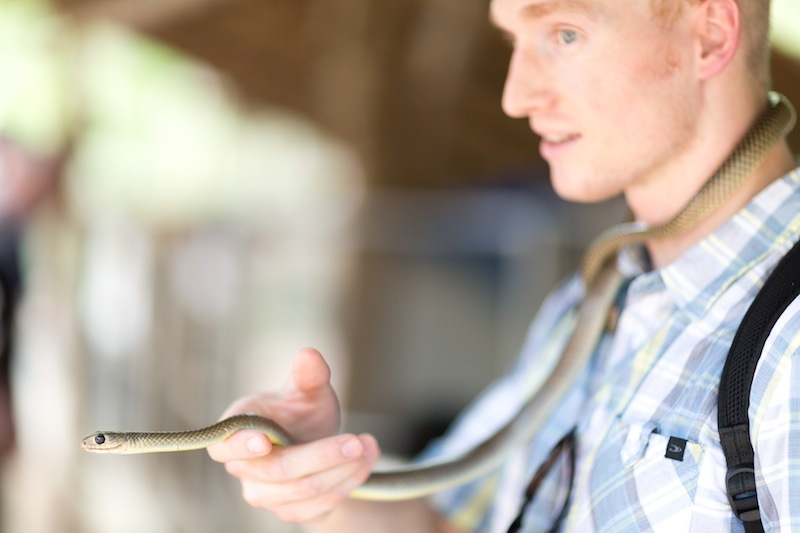 Holding some of Thailand’s most common snakes. 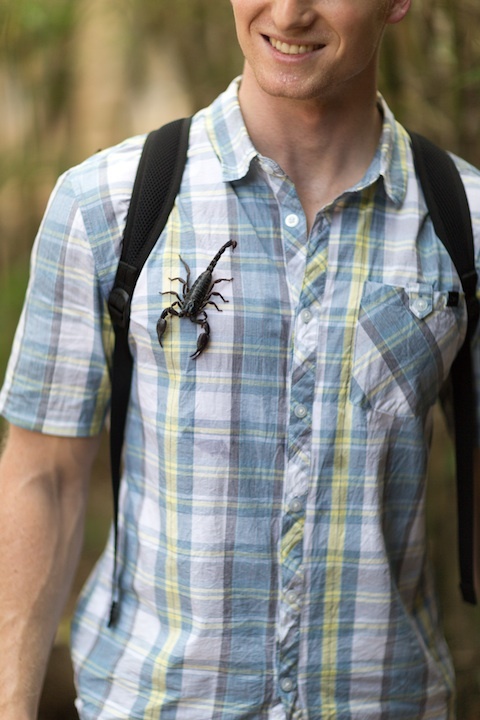 From elephants to king cobras, to tigers and scorpions – we took the hands on approach to learn the good and bad about the environment these animals live in on a daily basis. 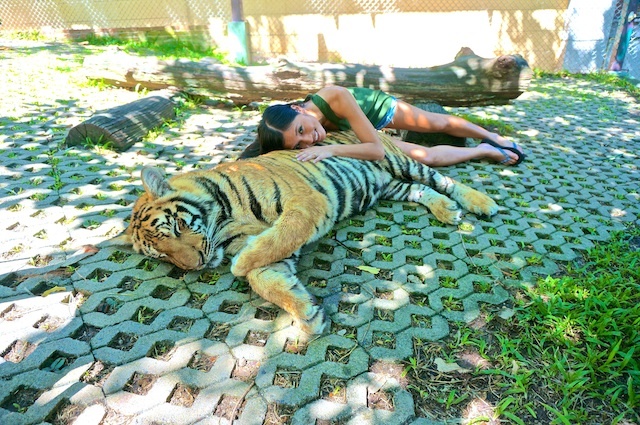 Animals are very important to us, and we wanted to hear first-hand from these places about the animals of Thailand, conservation efforts, and what is happening to protect these animals. Please stay tuned for more posts on protecting endangered or threatened animals. 2. Muay Thai, aka: Thai Boxing. 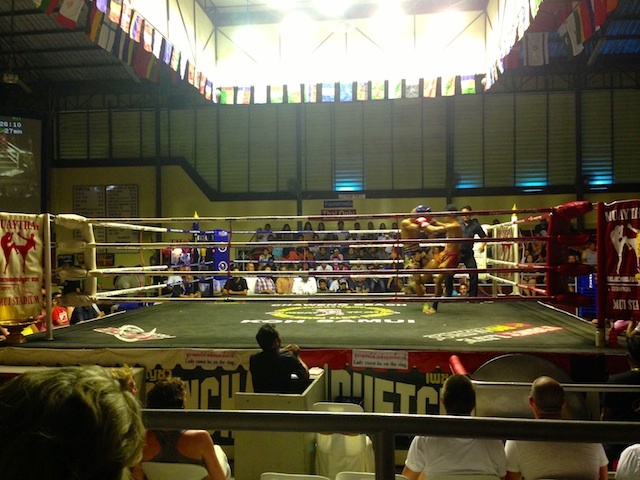 We were lucky enough to be in Koh Samui at the right time to see professional bouts of Muay Thai, not to mention meet up with a whole slew of New Zealanders who came up to watch one of their friends fight in his first professional fight (and he won!). We loved the experience so much, we decided to try it ourselves and got trained by the professional Muay Thai fighter in Railay Beach. We learned the basics on stance, kicking, punching, blocking, and all the ways that Thai Boxing is different than regular boxing. 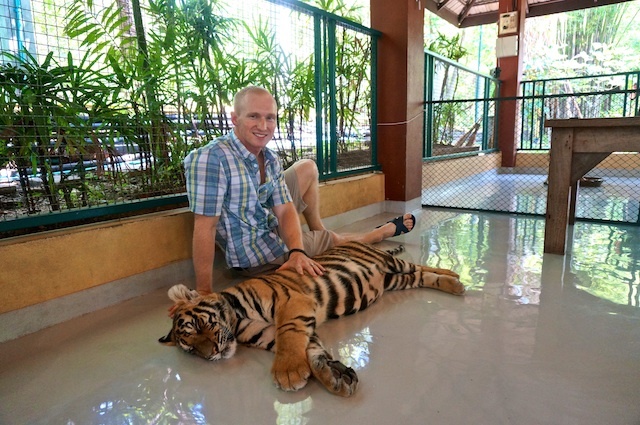 And this guy pictured – the professional? Yeah he kicked really hard. 3. 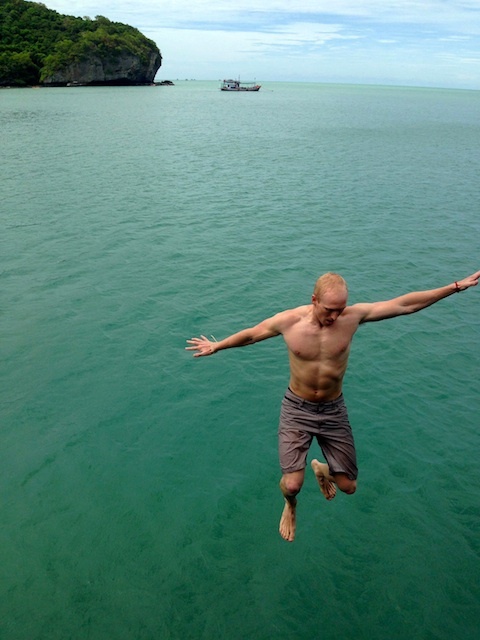 We jumped off things. 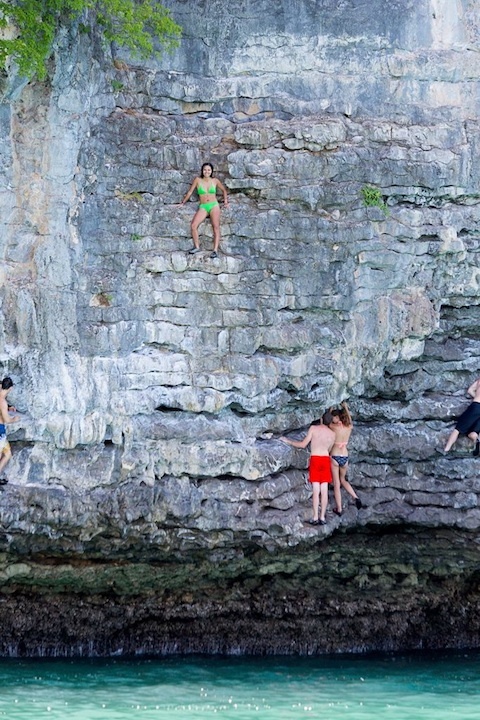 Actually, we jumped off A LOT of things – boats, rocks, diving boards, cliffs – you name it – but most notably, we did what is called deep water soloing, which is probably one of our favorite activities of all time. 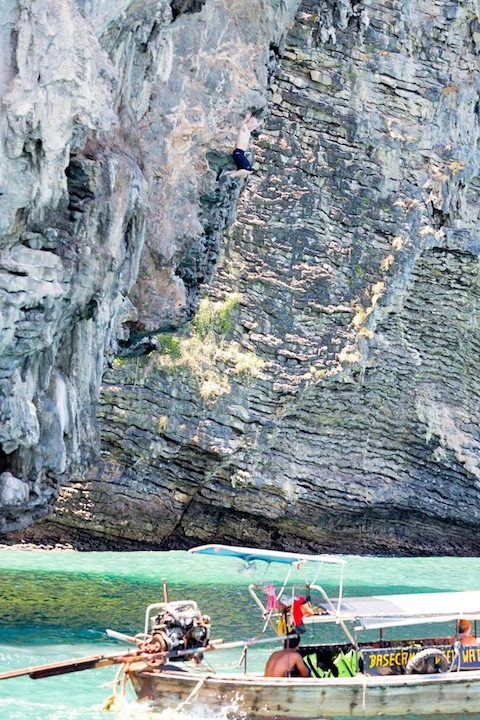 Pictured above, deep water soloing consists of taking a boat out to some great rock faces, free rock climbing as high as you can go and then letting go of the rock at any given point to drop into the ocean below. Slip and fall? No worries, the ocean will catch you. Epic climb 60-feet up? 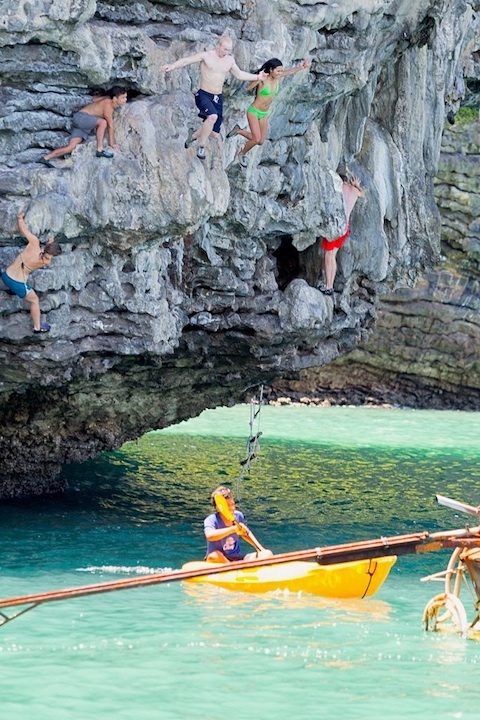 No worries, you can just jump in the ocean to get down. It was a blast, and an amazing workout. 4. 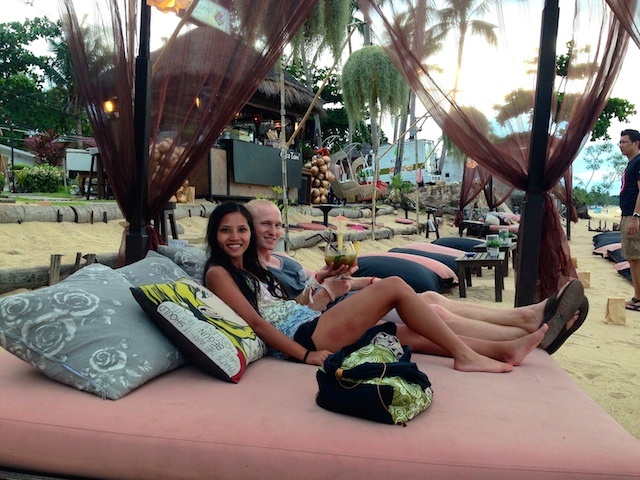 We found serenity (and good drinks) at Coco Tam’s in Koh Samui. 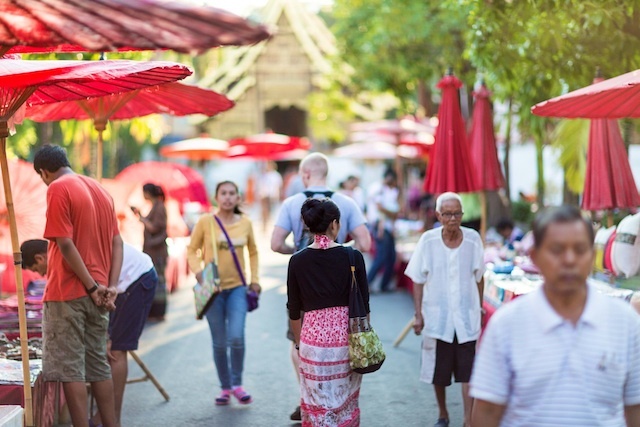 It’s important to kick-back and rest every once in awhile, and in laid-back Thailand there are many places awash on the beaches or in the alley ways of Bangkok to help ease your travel woes. We found Coco Tam’s at the very end of the road (literally) in the Fisherman’s Village of Koh Samui, with huge bean bags and day beds right on the beach, waiting for you to lounge and sip their fish bowl cocktails while you watch the sunset. 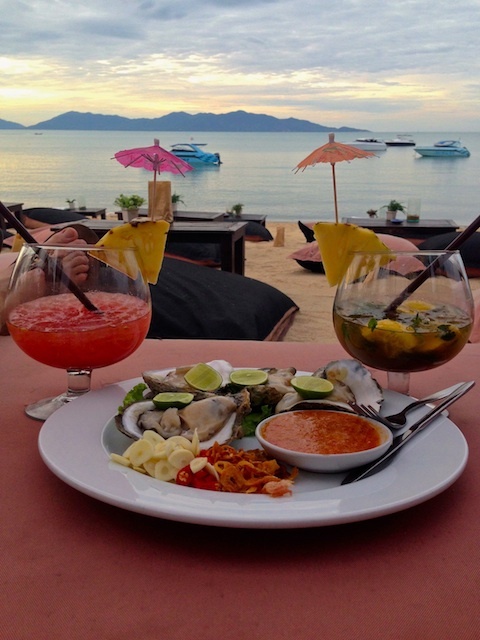 We spent nearly five hours here and would go back to Koh Samui just for Coco Tam’s. 5. Scuba Diving in Koh Tao! 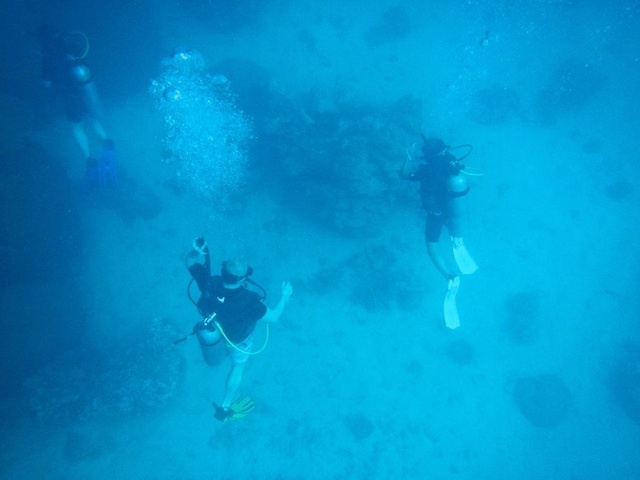 We love scuba diving and Thailand is known for some good scuba. Because we arrived in late May, the Andaman Sea side of Thailand was already in poor visibility due to the start of the rainy season in the Southern beaches, so we headed to Koh Tao to check out the crystal clear waters of the Gulf of Thailand. 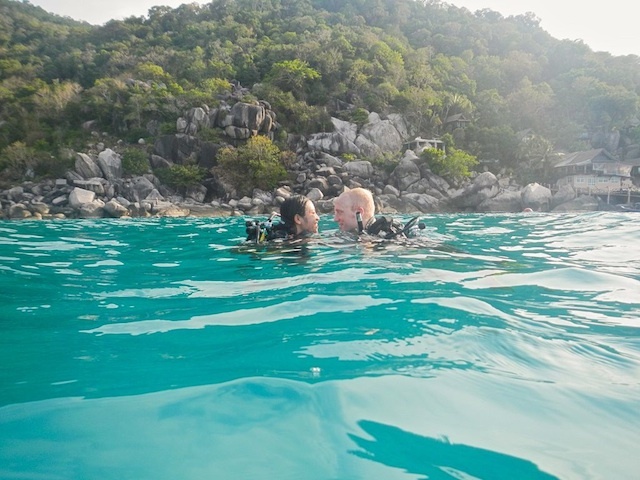 Koh Tao is a divers town, boasting the most dive certifications of any location in the world, and there sure was a lot of diving. 6. 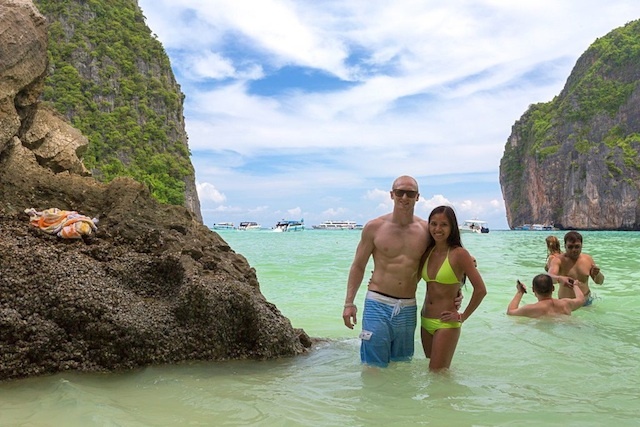 We were at one of the greatest – if not the best – place on earth: Railay. 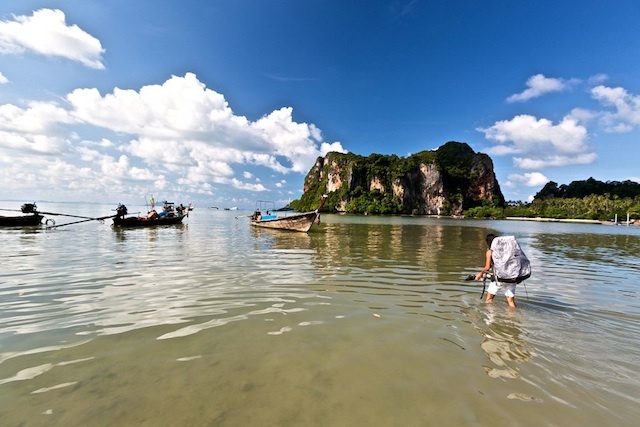 It doesn’t take fancy hotels or mind-blowing activities to make Railay Beach a special place. It is simply just amazing to be in Railay. Walking the beach, admiring the towering limestone cliffs, eating thai pancakes and smoothies along the shore – Railay is truly heaven on earth. 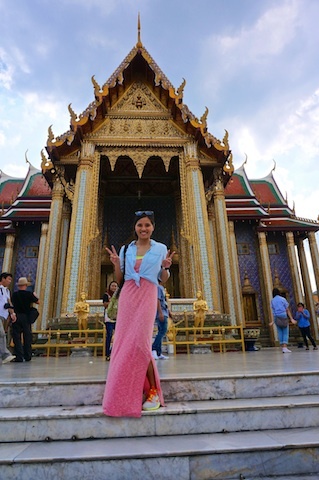 It’s one of those places you only hear about through word-of-mouth and is barely mentioned in travel guides, but thanks to friends of Liz she was able to discover it a few years back and boast it to be the only place to be in Thailand. After trekking through most of the country, Branden now agrees. 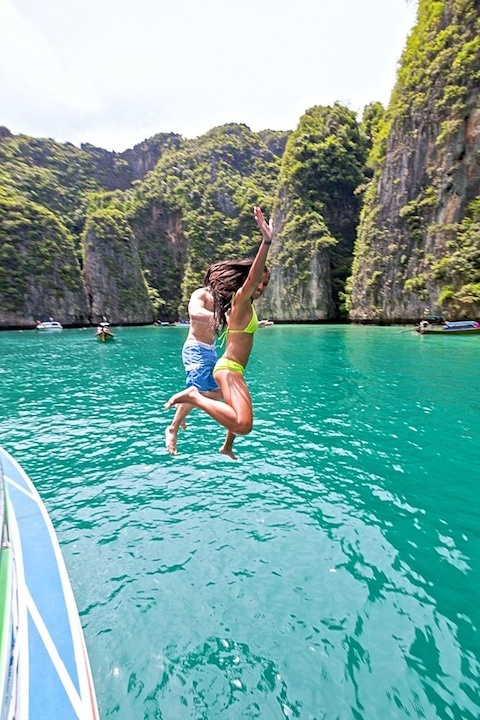 Railay holds a special place in our hearts. 7. We transported and saw a lot of beautiful country. 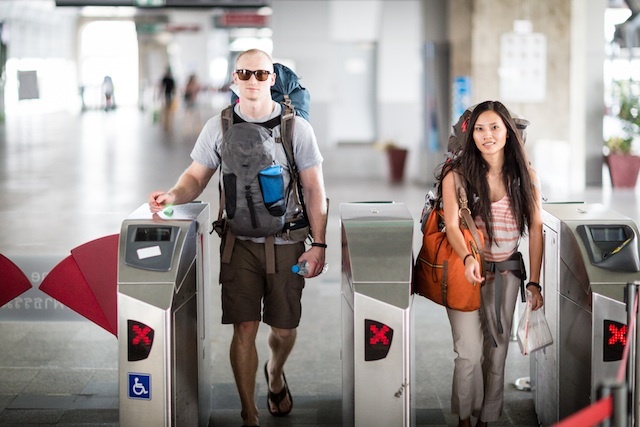 In true Thai fashion to get through most the country, we took planes, trains, buses, boats (large and small) – to get through all the corners of the country we could. And the best part is we saw beautiful country while doing so. Thailand is a breathtaking country of rice paddy countryside, to emerald green waters with awe-inducing limestone cliffs. 8. We took advantage of the outdoors. Big time. 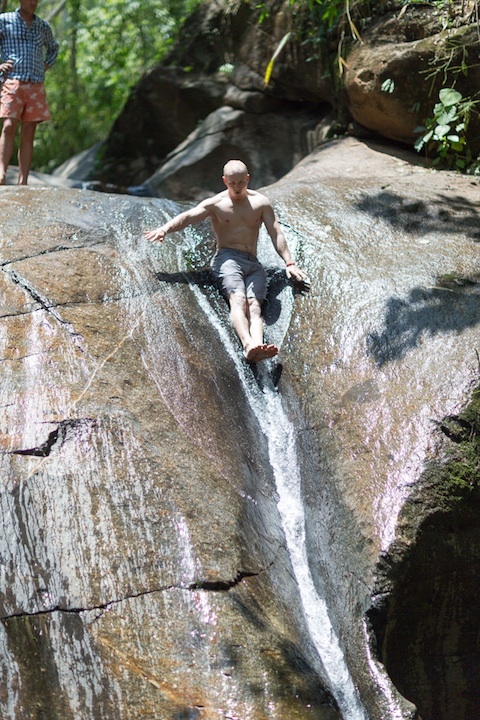 From naturally formed rock water slides, kayaking Ang Thom, and bamboo rafting down rivers – we played like we do in the Northwest but this time – Thai Style. 9. 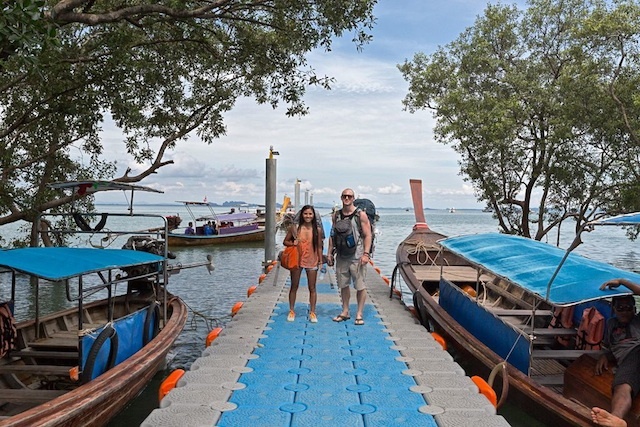 We did all the things you should do in Thailand. Like visit incredibly ornate temples. Market shop for cheap tank tops and trinkets. Get $5 massages – A LOT. 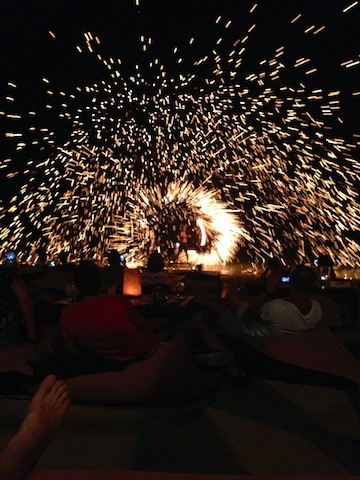 Mesmerize in the Fire Dancers. Island hopped to crowded beaches. And eat a lot of pad thai. Yeah, we did all that. And we liked it. 10. We did love things. 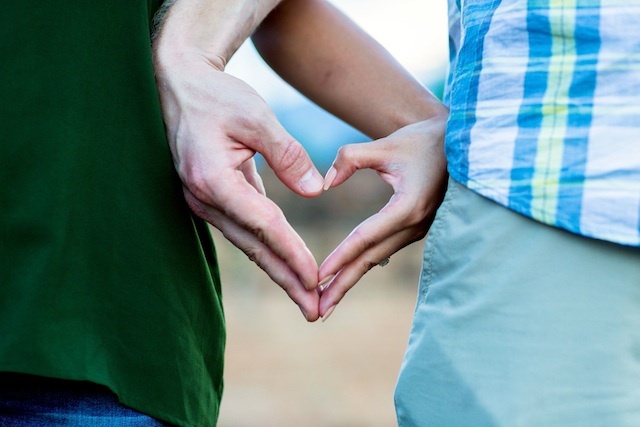 Thailand is a great place for everyone, but we think it’s especially a great place for lovers. Eeewwww, yes I said the word “lovers”. 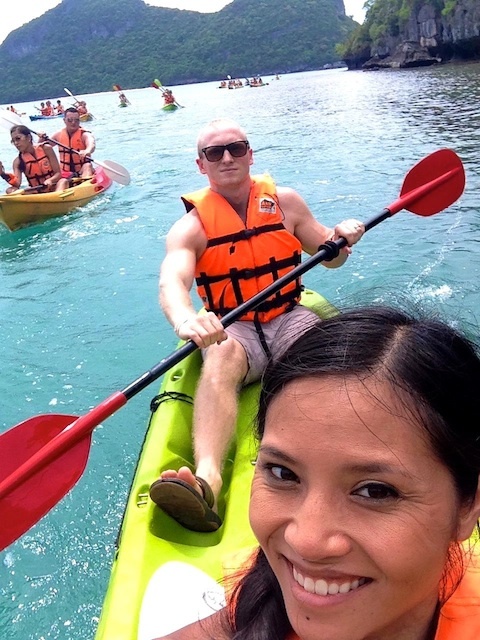 But strolling along the mystifying beaches, taking in the exotic smells of thai food and participating in heart pumping activities – Thailand was an amazing place for us to celebrate our love and continue to enjoy this Wed the World journey. 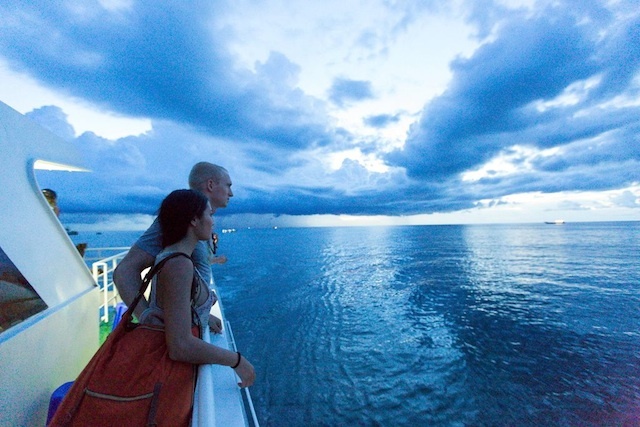 We couldn’t have asked for a better opening country to our SE Asia loop. Stay tuned for more in-depth posts of our weddings, travel stories, and the things we loved and did in each location. Don’t forget to LIKE us on Facebook or FOLLOW us on Instagram for quicker updates than our blog posts. 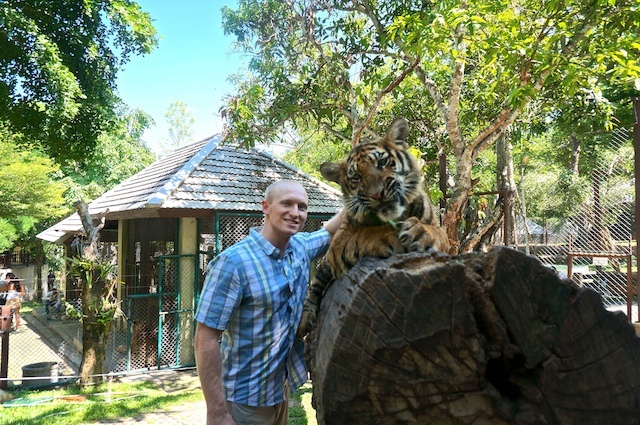 Thanks for stopping by and we can’t wait to share with you the rest of our journey from SE Asia!